Hey guess what, I'm going to be on BlogTalkRadio tonight! (That's Friday, February 3, 6 pm Pacific time.) 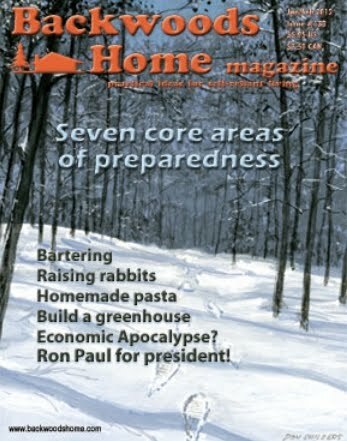 I'll be interviewed on Backwoods Home Magazine's portion of the show. Much of the discussion will center around the last article that came out, The Seven Core Areas of Preparedness. The link to the radio show is here. It also gives directions for how to tune in. I received a very kind email and blog mention from Dave Duffy, founder of the magazine, at his blog here. I'll be on during the second half of the program, so tune in around 6:30 or so. Now let's hope I don't blow it! Enjoyed hearing you on the show. Great job. Be sure to let us know when you will be on again. It was a great show! The cast iron show before you were on, talked about how great cast iron pans are especially the loaf pans used to bake bread. Do you have any experience with that? Show was good, but too short. You have a good voice for radio...maybe someday we'll hear you more! Thanks for posting the link! It was a great show. You did a great job and I enjoyed listening to your story. Hopefully the Husband of the Boss can join you next time. Maybe you should mention, for people who missed the time slot, that they can still go to the radio link and listen, or right click on the download this episode below and save it for future reference.